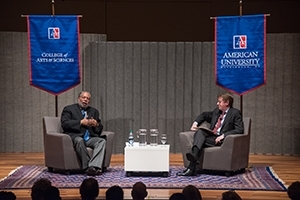 On Thursday, March 17, Lonnie Bunch (BA history '74 and MA history '76) sat down with AU President Neil Kerwin to discuss history, race, and his role as founding director of the Smithsonian's National Museum of African American History and Culture (NMAAHC). More than 100 students, faculty, and guests attended the event, which was sponsored by the College of Arts and Sciences Dean's Office. Bunch was appointed director of the new museum in 2005 after serving as president of the Chicago Historical Society. He is also an educator, curator, and esteemed author who has written extensively about the African American experience in America. The National Museum of African American History and Culture is remarkable in many ways, according to Bunch, who has been working on its creation for more than a decade. The 400,000-square-foot building will be located on a five-acre site-the last available spot on the National Mall-in the shadow of the Washington Monument. President Barack Obama will lead the dedication and the ribbon-cutting ceremony on September 24. The notion of creating a national museum to tell the story of African Americans was first proposed in 1913, said Bunch. The idea surfaced numerous times throughout the century, but it wasn't until 2003 that legislation passed-on its 18th attempt-to build the museum. The Smithsonian first broke ground on NMAAHC four-and-a-half years ago. But the building construction is only one part of the extensive work that went into creating the museum. Bunch discussed the multitude of responsibilities and decisions that he spearheaded over the past five years: developing a vision and mission, raising more than $500 million in public and private funding, staffing, publicity, partnership building-and collecting thousands of artifacts documenting several centuries of African American life, art, history, and culture. "We found treasures for the collections you would never imagine," said Bunch. The museum will open with 11 inaugural exhibitions featuring hundreds of objects. Highlights will include Nat Turner's bible, a railroad car dating back to the Jim Crow era, Harriet Tubman's shawl, Chuck Berry's red Cadillac, an airplane flown by Tuskegee airmen, and an extensive collection of art and photography. Bunch received both his bachelor's and master's degrees in history at American University. Bunch credits his professors for creating a close-knit community and for challenging him to be the best historian he could be. He said he found a second home at AU, one that provided the kind of intellectual rigor and academic curiosity that stayed with him his entire life. "I would not be in this position if it wasn't for AU," he said. "I was very fortunate to work with people like [history professor] Alan Kraut, people who both challenged and nurtured me. And what AU did for me was help bring a sense of order and structure to somebody who just loved history and didn't really know what you could do with it and how to use it." "History has always been something that has been crucially important to me," Bunch told the audience. His interest in the subject began at a very young age when his grandfather, who started his life as a sharecropper and ended it as a dentist, showed him a book with photographs of unidentified African American children from the 1870s. His grandfather said it was a shame that the children were labeled anonymous, and that no one knew about their lives. Bunch said this was the moment that got him interested in trying to look back in time to understand what people's lives were like. Bunch explained that he grew up in a town with very few African Americans, and he was confused about why some people treated him well, and why others did not. "So part of history was a way for me both to escape-to look back at a different time-but also try to understand a little bit about race in America. To understand why certain people would embrace you and why other people wouldn't let you in their backyard. And so for me it was personal. And then it became something that I realized would help us all understand the lives we live if we understood the past." The museum will open the doors with a weeklong celebration, extended visiting hours, and a three-day festival of films, music, dance, and other attractions. For Bunch, it will be the culmination of many years of hard work. "The museum will give the public what it wants, but also what it needs," he says. "The museum will tell the unvarnished truth, but will also help people find joy."